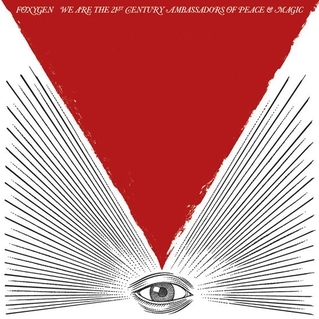 So there’s this new record out by this band called Foxygen. Out on January 22nd on Jagjaguwar, We Are The 21st Century Ambassadors Of Peace & Magic is full of sounds of the sixties. Which I know gets thrown around a lot lately, but it’s actually true with this one. There are lots of Judas-era-Dylan sounds (specifically on Track 2 “No Destruction”) by way of the spacing of syllables, the rhodes piano and the harmonica. Then came a second track (the above mentioned “No Destruction” was named Best New Track over at The Fork) and I was even more eager to hear this record. Luckily the Great Mike Marrone happened upon it by way of, we work in the “radio” “business”. In the kitchen at work yesterday he told me, “I think it’s going to be one of those huge records. But I haven’t decided whether or not to play it yet.” So it goes. Regardless, here it is and I’m telling you, GO listen to this record. Never before has the phrase “I left my love in San Francisco” been so perfect. (OK, side note here, if you’re going to write about the greatest city in the world, I’m bound to pay attention to your band. (Atten.) With lines like, “I left my love in San Francisco/That’s OK/I was bored anyway” Foxygen couldn’t miss.) On “San Francisco” [below], there’s a xylophone and a cute, childish sounding voice layered on itself with the piano. My god do I love the piano. This record sounds like Foxygen bottled nostalgia from the 21st Century and started taking a daily dose. It’s in the low-fi of “Bowling Trophies,” of sound effects of planes and trumpets with “oo-bahh baa swhup-bob”. With those single note guitar solos (the key Velvet ingredient and slide and piano pounds. It’s 1:46 near instrumental bliss. Like a missing track from a Nuggets box. This record is only nine songs long and they still managed to show off. It’s a shiny tidbit and an overlooked footnote from the mod English 60s and the tripped out Haight. Foxygen is the cool band. (Hell, even their name is cool – and fun to say.) They have a previous record called Take The Kids Off Broadway that came out this past summer, also on Jagjaguwar. It’s soaked in fuzzy goodness, sounds like solo Lou Reed and there are synthesizers, but it is less organized and less orchestrated (even with the kind of perfect repetitive chorus from the title track, “take the kids off broadway/take the kids off broadway,” the track itself is zany.) It’s a good record, but it’s not as great as We Are The 21st Century Ambassadors Of Peace & Magic. Foxygen is growing. They wrap up everything we love about popular music and twist it off, with a new twist. Thanks guys. Already, I can’t wait for more.